Zita Fleming, CSJ, ’59, is a social justice advocate, mentor and friend, social media enthusiast, and a true Regis force. Here, Sister Zita talks about her relationship and roles at Regis over the years, social change of the 1970s, and why she can’t live without her iPad. This is the extended version of the originally published Q&A in Regis Today (spring 2017). When did you work at Regis as the Dean of Students? What was your favorite part of that job? I was appointed dean of students in 1976 after teaching in the Classics Department and serving as coordinator of the Freshmen Faculty Advisers. The positions were great personal blessings for me and I loved every minute. Well, almost every minute. So did you find there were some challenges? Each day brought new challenges, surprises, joy, sadness, excitement. Being with these young women simply delighted me and the Regis community of CSJs who taught them. Resident life brought challenges, but I was always amazed by the caring and kindness the students extended to one another, even to those who might be difficult. Students picked up on the spirit of the Sisters of St Joseph “connecting neighbor with neighbor and neighbor with God” – how wonderful was that! Sometimes there would be a crisis or a disciplinary issue, but we grew by using contemporary psychosocial science and handled it. The Dean’s office developed a network and we took a positive rather than a negative approach by hiring a professional psychologist to train and reinforce students in best practices for interpersonal living. Students who were Regis resident assistants, for example, graduated not only with their academic major but with a complete tool kit and experience for social management, and the student body was strengthened to expect a reasonable process when there was a crisis or a disciplinary issue. This was community-building at the root. Perhaps my greatest realization in those early days was that while all wanted to learn and to grow, each Regis student was unique in her dreams and desires. I have never been a one-size-fits-all thinker regarding people anyway, but my job as Dean of Students really showed me that each person is a little mystery. How blessed I was to journey with these Regis students. Did it make a difference that you came into the job as a faculty member knowing Regis students in the classroom? I believe it did. I already knew Regis women and had shared with them a recognition of the importance of intellectual development – and social and spiritual development too. As Dean I heard more about their love for this or that professor whom they extolled and various classes. Each one believed that her professor was outstanding, the very best, and I loved hearing their gratitude and wonder at the richness of the Regis academic community they were a part of. Tell me about your work in Puerto Rico with Regis Admission. That began in the late 1970s. What a wonderful moment it was to be asked by President Sister Thérèse Higgins to accompany our Admissions staff to Puerto Rico. I had the opportunity to meet with the parents of our students, and they shared their hopes and concerns. That was the beginning of a 15-year annual trip to this beautiful island and meet and interview many, many prospective students. Our Regis women from Puerto Rico brought the charm and beauty of their culture, and the current students from Puerto Rico continue that legacy today. Their joyful spirits and graciousness brightened the Regis campus and community in ways they perhaps never imagined. So many shared that it was the moment that they drove up the Katsura drive for the very first time that their “love story” for Regis began—and continues to this day! What is the biggest difference between Regis in 1959 and Regis in 2017? Biggest similarity? Well, that’s a big timespan of sixty years! Regis has been a growing enterprise since its founding. Each decade had significant developments, but you could say generally that the twentieth century was a period of establishing our intellectual credentials and constantly trying to renew them. There’s a lot of discussion today about U.S. relations with Russia, for example, but in the 1960s there was, too, and one of our Sisters became a professor of Russian language at Regis. In 1959 the Regis student population was made up predominantly of young American Catholic women of Irish, Italian, French and Polish background. The United States was just about to elect the first Catholic President, John F. Kennedy, and Catholic college and university graduates of the 1950s and ’60s were being assimilated into professional and political leadership roles across the country. Regis women were educated to be part of that social phenomenon, and many graduates became lawyers, doctors, professors, artists, teachers, chemists, and entrepreneurs. Fifteen years or so later, by 1976, when I became Dean of Students, a great sociopolitical consciousness in the nation had already touched incoming and matriculating students because of the years of the war in Vietnam, the Civil Rights Movement, and the Women’s Movement. Regis President Sister Thérèse Higgins, CSJ, ’47, and the faculty “read the signs of the times” – a CSJ grace – and addressed social change. Boston schools had been rocked over race issues, and CSJ schools generally refused to go along with segregation, which was a very brave position to take in a heated historical moment. At Regis we deliberately opened our doors to young African-American women who wanted a college education; Regis had begun in 1927 because Catholic men’s colleges and universities would not accept women, so we understood the desire for higher education in new populations of students. At the same time, by the late 1970s, there was already a question of sustainability going forward as strictly a women’s college, and things were changing within the Congregation of the CSJs as well. We conducted a deep post-Vatican II aggiornamento process, gradually gave up the religious habit, and sought greater closeness in style to the people we served in our missions. 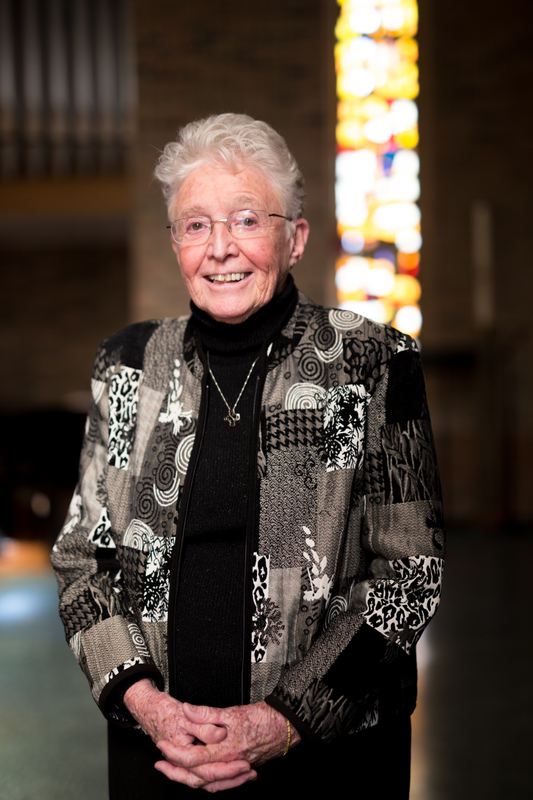 On the Regis faculty Sister Mary Oates, CSJ, conducted a study both of women’s religious congregations and Catholic women’s colleges staffed by religious women. Regis chose to remain a women’s college but we actively began broadening our base, cultivating an international student population, and Sister Thérèse and I worked closely on doing that. Regis had always had a handful of international students, but now we actively sought them, and we had students from all over the world, Liberia, Ethiopia, Japan, Peru, France, China, Puerto Rico, the Philippines, Switzerland, and more. All of our lives were enriched by these beautiful young women. How quickly they were embraced by the other students who befriended them, and for most they became lifelong friends across all the borders. The cultural life of the campus was stretched and broadened in perspective. Now, in 2017, the two big differences that strike me right away is that Regis undergraduate education is coeducational and that Regis has truly become a university with nearly as many graduate students as undergrads. And the similarities across all those years? Definitely the focus on the person, the uniqueness of each one, the desire of each one to be connected with others and to do meaningful and good work in life. Through all the changes, the recognition of the person was an abiding value, a constant we strove for. My office as Dean of Students was the center of that striving because it was the place where students came to share, to laugh, to cry, to hug, to seek guidance, to seek comfort, and sometimes even to complain. And in all of those moments there was a bond created that continues even to this day. Relationships developed out of the person-centered value we strove to uphold. Recently I had the pleasure of meeting and sharing with several Regis women from the ’70s and ’80s. They always enjoy reminiscing about their Regis days. When I asked them what gifts they received at Regis that stand out as being special and significant, they were quick to say quality education, their own empowering as human beings and as women, and the supportive community emphasis on integrity, leadership, faith, and friendship. They recall their Regis years as years that were enriching and vibrant. Alumni remember the special interest that someone took in them and usually more than one professor or administrator; in fact, they speak of the quality of caring in the entire Regis community toward them from the President on. Alumni have said outright to me things like, “Regis was a caring community. Our college experience seemed pretty unique and special.” And so it was! What kind of impact do you see the CSJ values having on current students at Regis? I mentioned being person-centered, but the way CSJs actually talk about that is by referring to “the dear neighbor without distinction,” that is, referring to inclusiveness. The times recently I have met current students or been around on campus mid-semester, I pick up this inclusiveness among them, this openness and mutual respect where there is cultural, racial, gender, or religious difference. That makes me feel that the cultivation of a certain attitude toward other people in which I invested a lot of my life and energy is continuing at Regis. Even though Regis is no longer as small and intimate a community as it once was, it seems really “big enough to lead and small enough to care,” as the tagline says. Why do you continue to stay so involved with Regis? As so many of alumni have pointed out, Regis developed friendships and strengthened a sense of community as a human norm; this is the way life is supposed to be. I stay involved because I’m already part of that – I can now say that members of a number of Regis generations are my friends – and because, as a member of the Sisters of St. Joseph, Regis and all our missions are extensions of our own community, too, and that means our relationships are always more personal than institutional – a rare gift in today’s world. Just like our students, you’re all about your iPad and you’re always on social media. Technology has brought about a communications revolution; people in the past twenty years are more likely to connect by e-mail or cell phone or text, so I picked up some social media skills to stay in touch not only with Regis and the alumni office but with everyone! And yes it is true, my friends call me “Queen of the iPad.” It’s a great resource for connecting. One of the blessed connections through my iPad is sharing daily prayer with fellow alumni each morning. They share how they integrate these blessings into their daily lives and their families. We have a Regis prayer line that has emerged, praying for one another in time of need, praying for the Regis Community and the continued growth and mission of our alma mater. It supports our CSJ charism and mission “connecting neighbor with neighbor and neighbor with God” and ever-widening circles! 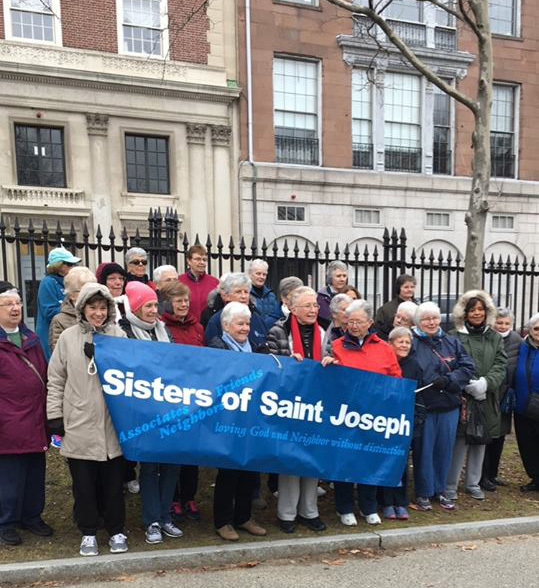 You recently participated in a women’s march in Boston with fellow Sisters of St. Joseph. Tell me about that experience and why it was important to you and the Congregation. If you ever visit the Motherhouse in Brighton and attend a meeting on the top floor, the windows give you an almost 360-degree panorama of the various neighborhoods of Boston. CSJs have staffed schools, parishes, social service agencies, and projects all across that terrain and into the suburbs. In over 150 years in Greater Boston, we have known families, children, and communities and worked woman to woman with students, mothers, working women, immigrant women, widows, and homeless women. We know the terrible effects of poverty, wage inequality, education gaps, and prejudicial social and political structures. We have walked beside women enjoying phenomenal socioeconomic success but encountering difficult family situations because of it, or severe injustice in the “glass ceiling” or the limits put on financial growth simply by being a woman. There was no way we could not participate in acknowledging the struggle of women and children in our world – they are the majority of the poor – and in seeking together with thoughtful women and men of every good persuasion to create more just social policies and practices. The bottom line is the great commandment to love God with your whole heart, mind, and soul and to love your neighbor as yourself. Around the world today, not merely in this country, human rights are women’s rights, and in this country we experience a deteriorating social climate demeaning to women that we must resist and change. Regis launched its comprehensive fundraising campaign, Now We Fly, in April 2017. What does Now We Fly mean to you? Socially and economically, both families and job opportunities have undergone radical shifts as two parents work and as technology determines a different world order. Regis had to make big decisions early in the 21st century in order to survive and under President Mary Jane England, MD, and President Toni Hays, PhD, RN, it had the courage and the foresight to make those changes. As the first Dean of Nursing and now President, President Hays especially has sustained the Regis commitment to liberal arts education and simultaneously given Regis a solid footing in developing nursing and health professions in the Greater Boston health arena. I said earlier that the whole 20th century was about establishing our intellectual credentials, but that is a process that does not and must not stop. If you’re going to educate, you have to educate students where they need to be educated. Globalization and technology have challenged Regis to turn into the winds of social change and spread its wings. That’s what Now We Fly means to me – Regis graduates being able to enter and thrive in an ever-widening global landscape here and now and to do so with nimble awareness of how to make good decisions no matter where life leads.